A fundamental and a magical craft. 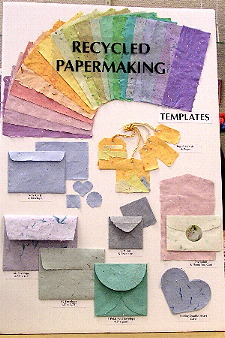 Make new paper sheets, envelopes, note-cards, boxes, decorations - whatever your imagination suggests. 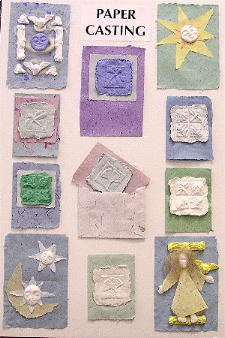 Use your own paper scrap, supplemented with specialty lints and pulps, gathered or purchased botanicals, or even bits of glitter. We have books, kits and a variety of tools and supplies. You will see references to the "pour method" and to the "dip method". The pour method makes paper by pouring slurry through the deckle (a mold or frame with a screen bottom). The dip method uses the mold like a scoop. The same materials are used for both, and most of the same tools.